The German queen of the ‘Ring and famous TV personality Sabine Schmitz teamed up with Skoda recently to attempt an unusual Nurburgring record. She took the new, yet-to-be revealed Skoda Kodiaq vRS around the Green Hell and set the fastest time ever for a seven-seat SUV. The Skoda Kodiaq vRS went around the Nurburgring in 9:29.84 minutes-a record hardly impressive on its own, but remarkable for the type of vehicle with which it was achieved. The Kodiaq is a big family SUV with seven seats and plenty of room for people and luggage. And although it’s the RS version, which means it’s been tuned and tweaked to be sporty, it is still a high-riding, heavy utility vehicle. All of that makes the lap record something for Skoda to be proud of. The 2019 Skoda Kodiaq vRS boasts a diesel 2.0 BiTDI engine which produces 239 PS. Again, the power output is nothing to write home about, but engine is a good compromise between power and efficiency. It comes with SCR catalytic converter for extra cleanliness and features Dynamic Sound Boost for extra driving pleasure. The all-wheel-drive RS also gets adaptive Dynamic Chassis Control (DCC) including Driving Mode Select and progressive steering. “The SKODA Kodiaq vRS is great fun on the track,” said Sabine Schmitz. “SKODA has made full use of its large SUV’s potential with the Kodiaq vRS. 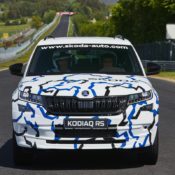 I can certainly imagine that I’ll be encountering the Kodiaq vRS regularly during my laps around the Nordschleife in future,” Schmitz adds with a wink. The post Skoda Kodiaq vRS Sets Nurburgring Record for 7-Seat SUVs appeared first on Motorward.